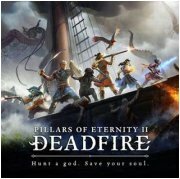 Game: "Pillars of Eternity 2: Deadfire"
Review: I was worried, diving into Pillars of Eternity 2. I had been meaning to try the first, it looked like a great game. I even had it in my monstrous Steam backlog! But time makes fools of us all, and now the sequel is out. What's an adult who loves video games supposed to do? Thankfully, PoE2 is there for you. Through the handy story-telling mechanic of amnesia, you can play right along with not knowing about how you're a Watcher, a sort of collector of lost souls, who saved the whole world from a mad cultist and made a pretty penny doing so, right up until the long believed-dead god of light arises and basically ruins your everything. Now, with what's left of your fortunes poured into a sailing ship, you've got to track down this wandering giant and figure him out before the god of death yanks your chain and you join all the lost souls left in the errant god's wake. That's a bit of an oversimplification, of course. It's hard to describe the story and the world itself without cutting a lot of corners. It does all come together as a richly woven story about pursuing your own goals while literally pursuing a god, all the while being manipulated by the rest of the gods. I was most grateful for the decision to include highlighted terms throughout the game, with rollover that explains everything from significant places, to colloquialisms, and even spell/status effects. There's a ton of all those things to remember, but these little in-line crib notes are a huge help to the point where I could almost pretend to know exactly what happened in the first game. That spirit of helpfulness extends to the gameplay itself. By default, your party is set to engage in combat using whatever skills and abilities you've selected for them to the best of their ability (and skill!). You'll want to eventually drill down enough to figure things out yourself to produce more varied strategies, particularly in the later game, but it's a great help to have a new magic user more or less handled for you while you're still learning the ins and outs of the warrior you just made. You're even offered ways to fine tune these bits of help, including the option to have otherwise hidden character motivation-type lines of dialog highlighted for you in conversations in case you want to get granular with your character's personality. Choices really is the game's strongest suit. The countless in-game options, the equipment combinations, non-combat skills, and the ability to pick the support character's classes give you plenty of options for how to achieve your goals. Heck, once you've gotten your ship out on open waters you're essentially free to go wherever and do whatever, restricted only by potentially getting reamed by encounters much higher than your current character/crew level. The new ship mechanic comprises the other half of the game. Apart from feeling things out on dry land, you'll need to keep your ship stocked with supplies and staffed by capable sailors, lest ye be flushed down Davy Jones' porthole. Separate from your adventuring party, the crew have different skills pertaining to ship duties (helmsman, gunner, cook, etc) that will give you an edge during combat and the myriad encounters at sea. And during ship-to-ship combat, you'll have to task some of them with putting out fires, or just taking a load off when they get hit by a stray cannonball. Certain aspects of the ship game felt a bit odd. In one particular instance, I hired one more crewman than I could handle, intending to swap him in and replace an inexperienced crewman. Instead, I was told that I could only swap the new guy in at a port city that was several days away. Why? And how did that guy get there from here? Was there some note in his contract about paying for his relocation? The other odd bit is the relationship between ship combat and the normal party-based combat. Several times I took on ships rated slightly higher than my level and used cannonfire to clear their decks of crew members, only to board them and be flattened by a still-active crew. I'm not suggesting that my board parties should be treated to the sight of mangled corpse piles on every attempt. Just... maybe all that grapeshot hitting the enemy crew did more than just annoy them into not doing their jobs until we showed up in person? Here's the thing, though: I complain about my group of adventurers being outclassed in person on the high seas, but I still spent hours running down merchant ships and relieving them of their precious cargo (and lives). I still wound up with a veteran crew that, frankly, could have probably stepped in for the actual heroes on land. I still lusted after the best cannons and ship upgrades long before I could even begin to afford any of them. If that's not a successful execution of a new game mechanic, I don't know what is. I ran across a few minor bugs in the game, most notably one that prevented me from exiting one ship battle and diving right into another, but those issues only succeeded in highlighting how engaging the game is. You'll feel totally engrossed in the story and world-building that takes place, all without fear of being overwhelmed by all the new lore and phrases coming your way. And whether or not any of that interests you, whether you'd rather just blitz through the main campaign or sit around plugging ships for loot in between sidequests galore, PoE2 has you covered.